Home » My Country Gardens » What Are We Dealing With Here? Anyone have any ideas as to what animal we’re dealing with here? Last night something “picked” all of the small developing squash on seven of the squash plants in our meadow garden. 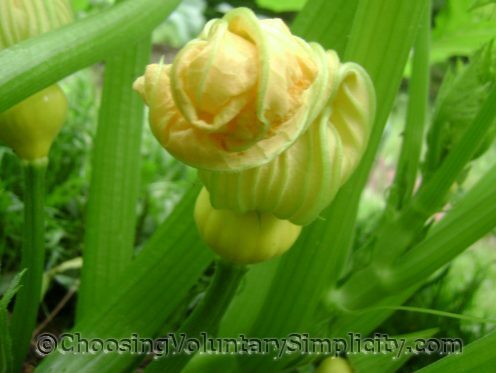 The squash were cleanly broken off at the stem end and every small squash on all of those seven plants was taken. The squash on all the other plants was not touched, and there were no partly-eaten tiny squash left on the ground… the squash are just not there any more. We have bear, deer, skunk, raccoon, turkeys, bobcats, coyotes, squirrels, and chipmunks… and probably other animals we’d rather not know about… around here all the time. The soil in that garden is soft and it rained hard last night, so any paw or hoof prints should show, but the soil seems to be undisturbed. My husband is in the garden right now, building low (removable in portions) frames that will go around the squash plants. We have wire with small holes to staple over the top and sides of the frames… to keep our unwelcome visitors out and protect the rest of those tiny squash. Or at least… that is the plan! I think your thief is a raccoon. We had whole tomatoes disappearing from our garden last summer and it looked like someone was picking them but we found out one night that it was raccoons picking them and carrying them off. I think they’re doing that with your squash. I’m guessing deer although I would think they would also eat the plants. I could be prejudiced against deer at the moment because deer are ruining our garden this year. I used a commercial deer repellent but it does no good at all. I don’t have a guess, but what a shame. I hope the rest of your garden can be protected by your clever idea for a covering. Thank you for this blog. I read it daily and have learned a lot. My first thought was do you have any neighbors who like squash blossoms? I’m with Ned. My first thought was a person. Possibly the woman who pulled up your ferns? If the soil was soft and there were no footprints, that rules out human, deer, and most of the other critters on your list, unless the hard rain happened after the theft. I’m guessing it was a squirrel starting to store things for winter. Hope the fence works!